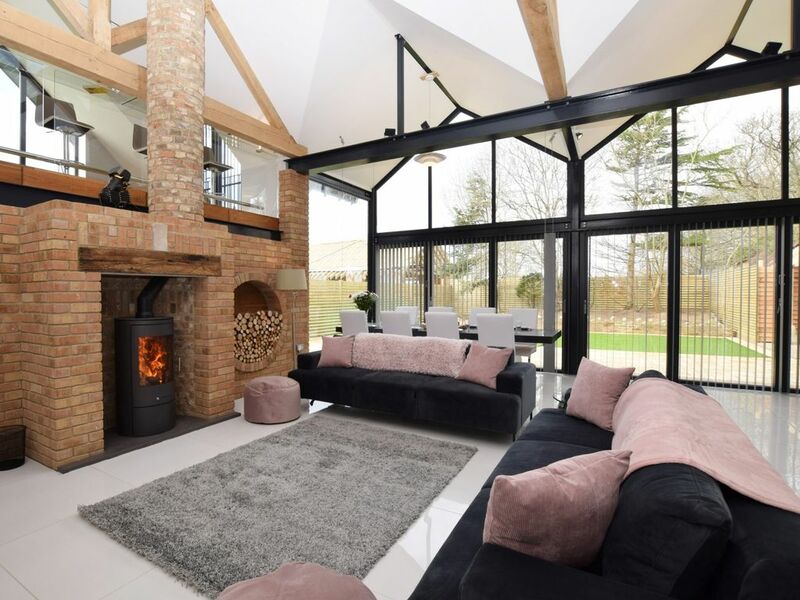 Set alongside the road heading through the hamlet of Wigbeth this contemporary barn conversion was completed in 2018 and is ideally situated for taking in the local attractions with Wimborne Minster Badbury Rings Moors Valley Country Park and the New Forest National Park all within easy reach. Set near the Dorset/Hampshire border and a short trip from Cranborne Chase there are many scenic walking and cycling routes that run directly from the property taking in the breath-taking views on offer in this picturesque spot. Take a trip to the market towns of Wimborne or Ringwood ideal for an afternoon spent browsing. The beautiful beaches of Bournemouth and Poole are also accessible by car from here. On entering the detached barn originally built in 1680 you are met by a stunning open-plan living area incorporating the kitchen/diner/lounge with full height vaulted ceiling. Bi-fold doors to the rear flood the room with light and a striking circular fireplace with wood burner will instantly make you want to linger a while. This sociable space is cleverly divided and is the perfect place to unwind after a day spent exploring in the lounge area you can enjoy relaxed evenings in and watch a film on the Smart TV. The stylish kitchen area is well-equipped with a double electric oven and induction hob American style fridge/freezer dishwasher microwave fresh ground coffee machine and washer/dryer. There is also a separate WC. Through the lounge area you will find a double bedroom with en-suite shower and WC and a king-size bedroom with wet room style shower set into the corner of the room and a separate WC. The first of two staircases this one a spiral leads you up to the first floor from the kitchen area. Here you will find an impressive king-size bedroom with vaulted ceiling views over the lounge and an en-suite shower and WC. A second staircase rises from the lounge area to a mezzanine with snug views over the lounge a Juliet balcony and a comfy sofa this is the perfect spot to relax with a good book. Leading on from here is a super-king-size zip-and-link bedroom (which can be made up as a twin on request) with a Juliet balcony and en-suite shower and WC. Heading outside you will find an enclosed garden with a patio area garden furniture charcoal BBQ and artificial lawn. Located directly outside of the spacious living area it s the perfect spot for enjoying al fresco dining. There is off-road parking for two cars to the front of the property.